With this model I wanted to capture the essence of battle since I thought that too many previous battlescene entries were more "scene" (e.g. diorama) than "battle". 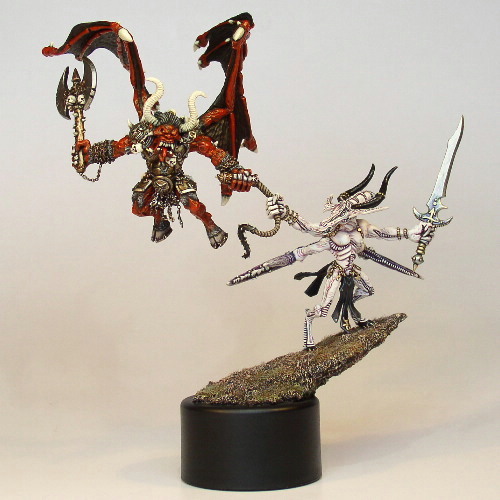 Therefore I portrayed the lord of battle, a Bloodthirster of Khorne, fighting his (WFB-) arch enemy, a Slaanesh Keeper of Secrets. Obviously, the model demanded a lot of pinning! Having done humans for the duel in 2001 I returned to chaos in 2002 depicting champions of Tzeentch and Nurgle in bitter struggle.